TOGAF® is one of the most popular EA frameworks today, and many organizations consider it to be the de facto standard. 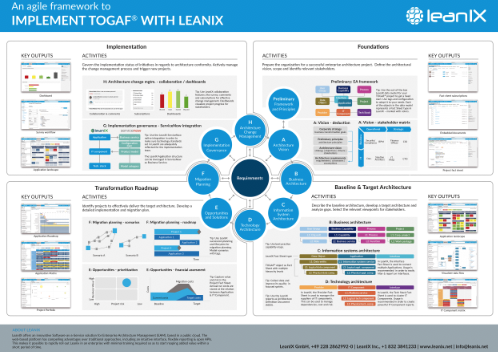 Find out how to implement TOGAF®quickly and efficiently with a lean Enterprise Architecture tool. Prepare the organization for a successful Enterprise Architecture project. Define the architectural vision, scope and identify relevant stakeholders. Describe the baseline architecture, develop a target architecture and analyze gaps. Select the relevant viewpoints for stakeholders. Identify projects to effectively deliver the target architecture. Develop a detailed implementation and migration plan. Govern the implementation status of initiatives in regards to architecture conformity. Actively manage the change management process and trigger new projects. Download your guide now to quick start TOGAF® with a lean EA tool!